IRELAND IS TO seek a financial bailout from the EU and IMF. 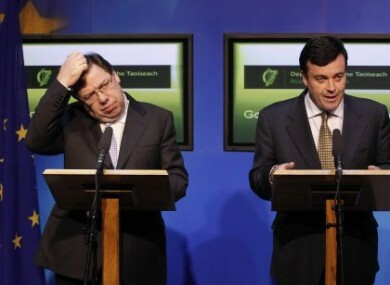 In a hastily-convened press conference at government buildings last night, Taoiseach Brian Cowen and Finance Minister Brian Lenihan confirmed that Ireland has asked for a bailout from the EU/IMF. In a lengthy address, which was followed by a sometimes heated questions and answers session with journalists, the Taoiseach refused to be pinned down on the details of the bailout. But he insisted the question of Ireland’s corporation tax had not arisen. However, the Irish Times reports today that Germany and France “are not alone” in their push to increase the rate in return for aid, according to a European source. Cowen also said he would not be resigning and expected to lead Fianna Fáil into the next election. I can confirm that the government has today decided that Ireland applied for financial assistance from the European Union. He went on to say that a formal process of negotiation would now begin, and would be finalised in the next few weeks. However, he refused to say how much money would be involved, or how much sovereignty would be sacrificed. There is speculation this morning that the bailout will involved €80 billion to €90 billion, and that deep cuts will be made to the minimum wage and to welfare benefits in order to meet the terms the bailout and close Ireland’s deficit. Last night, Cowen said that the package would have two elements. The first would be a major restructuring of Irish banks, which “would become significantly smaller than they were in the past”. The second part of the package would involve a strong policy programme that saw the government reducing spending and increasing taxes to a level that the country can afford, he added. A sombre-looking Cowen warned that everyone in Ireland would be affected, but that he intended to ensure “everyone would know where they stood”. He called for the same level of solidarity from the Irish people as has been shown to us by our European neighbours. We should not underestimate the scale of economic problems, but we must have faith in our ability as a people to recover and prosper once more. The Finance Minister Brian Lenihan insisted every step the government had taken since the summer of 2008 was designed to seek “economic continuity”, and that a bailout was the only responsible step. It is essential that we continue the path of correction in relation to the state finances and the banking difficulties of the past few years. Lenihan added that both UK and Sweden were both ready to take part in bilateral aid package. He said the total amount would be less than €100 billion. It is expected that the British Chancellor George Osborne will make a statement on his country’s plan to help Ireland later today. Asked if he bore responsibility or felt any shame, the Taoiseach replied that “the goverment won’t be deflected from the duty it has to discharge” and said he would not be stepping down. He confirmed he intended to lead Fianna Fail into the next general election. …the final epitaph for a Fianna Fáil government that has plunged the country into the financial abyss and that has consistently and deliberately lied to the Irish people. Meanwhile, Reuters quotes a senior EU source, who says that the size of the rescue by the European Union and the International Monetary Fund has yet to be negotiated but is likely to be smaller than Greece’s bailout. “I would say we are talking about €80-90 billion ,” the source said, adding that this sum would include money to support the Irish banking sector. Also speaking to Reuters, Olli Rehn said experts from European Commission, European Central Bank and IMF would prepare a three-year package of loans by the end of the month. Providing assistance to Ireland is warranted to safeguard the financial stability in Europe. The program under preparation will address both the fiscal challenges of the Irish economy and the potential future capital needs of the banking sector in a decisive manner. Last night the German Finance Minister Wolfgang Schaeuble was eager to play down the risk that Ireland’s crisis might spread to other weaker euro zone members. “If we now find the right answer to the Irish problem, then the chances are great that there will be no contagion effects,” he told ZDF television. Email “Bailed out: Ireland expected to borrow at least €80 billion”. Feedback on “Bailed out: Ireland expected to borrow at least €80 billion”.